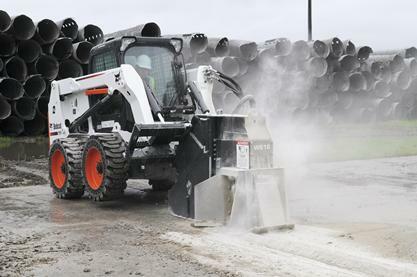 Powered by the carrier’s high-flow hydraulics, the wheel saw cuts through asphalt, concrete, and other materials to produce a trench for installing utility lines. The trench cleaner (available with 6 in. and 8 in. wheels only), which is raised and lowered hydraulically, assures a clean trench for installation. Use the hydraulic depth adjustment gauge to deliver a consistent, uniform cut depth. For operating close to curbs and walls, the hydraulic side-shift allows the attachment to shift flush with any nearby object for a close cut. The wheel saw is the ideal attachment for road repair crews and rental facilities. The hydraulic motor turns the carbide tipped wheel to cut material which then exits through openings on the side of the wheel saw. A hydraulic cylinder controls the depth of cut. A second hydraulic cylinder raises and lowers the trench cleaner to provide a clean bottom trench. Trench Cleaner: Hydraulically controlled, the trench cleaner ensures a clean trench is left behind when operating the wheel saw (6- and 8-inch wheels only). Hour Meter: Hours are electronically stored on the attachment and can be read with the deluxe instrumentation panel on Bobcat M-Series loaders to keep track of service intervals and component life.